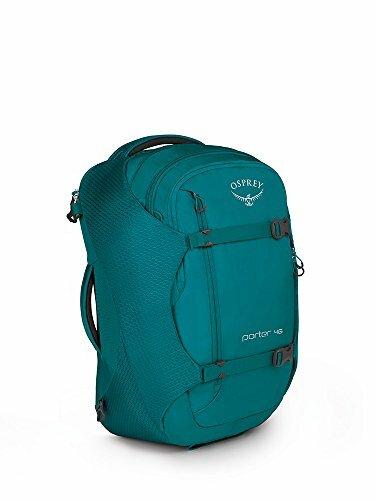 Osprey Porter 46 vs Farpoint 40 - Which Is The Best? The Osprey team produces great quality packs that are hard to choose between. And in this review I am going to cover the Porter 46 vs Far﻿point 40., two of the best travel daypacks on the market. Although they are quite similar​, there are some fundamental differences. This is actually great news, because it helps us make a choice! I know which one I love, but it's not about me - it's about what is best for your travels. Do you have more electronics? Or do you prefer a more sturdy backpack? All this will become clear! The Osprey Porter 46 is a very handy travel bag, especially for those wanting to take lots of electronics and fit in a lot of gear. The inner storage area is very deep & wide and can fit a lot of your gear in it. It will definitely be a great choice for weekend trips or people just wanting to have a lot of stuff with them (jacket, shoes, toiletry and more! Yes, it's big). And it comes with compression straps on the front to help keep the size down for carry-on. Something we all love (not having to check in your bags!). Or, if you aren't carrying much (or storing it) you can compress it way down and make it a lot smaller. In general it sounds like an awesome pack, but will it still look like that when we get down to the details? Let’s find out! The ﻿Osprey Porter comes with a lot of padded carry handles (top, side, bottom), maybe too many. But they do come in handy once in a while, especially when you are not using this as a backpack. (picture trying to grab it out of the overhead bins on a plane). Waist straps are stored in the bottom, and they can be tucked away for flights, and used again once you land (if you check the luggage in). Just keep in mind that the hipbelt is not super-padded so although it's great for travel, it might not do the job if you intend on doing long day hikes or carrying heavy loads. But for most travelers, it will be more than enough. The main electronics storage area is on the back panel, which is a design improvement as compared to last year's model. This way your electronics will be much safer, as there is no way that someone could actually get to that compartment while you are carrying the backpack. This will also be very handy when you have to get all your gear out for security checks at the airport. It's very spacious, fitting a reasonably large laptop (like a 13" Mac) as well as having a nice pocket behind that for other gear (kindle, iPad etc). And there is also space for a phone, diary, mouse, cables, chargers etc. All in all, well thought out. So, you have all your electronics and small stuff sorted on the front, but how much space do you get inside? This pack is big! In fact, most of the area below the front panel is an open storage compartment that is very deep. There are also two zippered pockets running the length of each side for more of your smaller stuff, or just to double as a laundry bag. And with the compression straps I mentioned earlier, it's easy to cinch down your load once the panel is closed and you are ready for travel. Just keep in mind, this area is harder to access (like a suitcase) so you will want your travel documents, electronics etc all in the front panel while you are traveling. Yes, the main compartment is pretty large, and you can pack a ton of stuff in it. And you have a dedicated compartment for all your favorite electronics. But, what else does the Porter have to offer, and can it really convince you that it is better than the Farpoint? For one thing, the front compartment (which used to be the laptop compartment) now features an organizational panel, and it has lockable zippers. And the compartment is still pretty spacious, so you could definitely pack all your in-cabin necessities inside it, and have them all handy during the flight. All of that without ever having to open up the main compartment and mess up your packing efforts. The new Porter 46 also features a zippered top pocket, so that it's even easier for you to stay organized. From the top of my head, it's a great compartment for your toiletries or any liquids that might accidentally get spilled in the main compartment (if you're as unlucky as I am). And it's so far away from the electronics compartment that there's no way a drop would ever get to your precious laptop. We've established that the Porter 46 will allow you to pack plenty of items, and organize them all just how you like. Notice I said plenty of items there - 46 liters is a lot of storage space, and you are bound to feel the weight of the pack when you have to carry it around for a few hours. So, what can you expect, in terms of your own carrying comfort? For one thing, the back panel is padded, so there shouldn't be any items from inside the pack that are poking you in the bag. However, it's not ventilated, which is a big downside in my opinion. Just imagine walking around in the middle of August with this beast on your back - you are bound to begin sweating bullets after about half an hour. The shoulders straps, on the other hand, are padded and ventilated, so there's that. They also come with a sternum strap that doubles as an emergency whistle - perfect for all of us who couldn't whistle to save our life. And the job of the sternum strap is to keep both of the shoulder straps in place, so that one of them can't just slip off. I mentioned already that there's a lightly padded hipbelt, but I didn't tell you what it's main purpose was. Well, it has to do with your carrying comfort; a hipbelt helps distribute the weight of the pack across your entire torso, so that you shoulders aren't the only ones carrying the load. That means that the pack won't feel too heavy on your back, and that you should stay reasonably comfortable even when it's fully packed. Overall, it looks like a very comfy backpack - especially for its size. And the shoulder straps and the harness can be stored away in their separate compartment, for when you want to put the Porter in the overhead compartment, or trunk of your car or whatever - the point is that you hide them so that they won't get caught on anything. The straps are not the best I have seen, so it's only good for short distance carrying (or lighter loads). Once you buckle the compression straps, it's hard to get to most of your stuff. At 46L size it's getting quite big and may not be allowed on all planes. It also gets heavy with all your electronics and clothes so is not great for long walks! The back panel is not ventilated, so you might get sweaty when it's hot out. 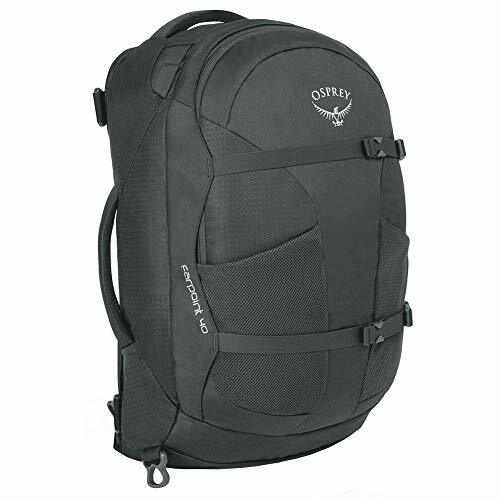 The smaller version is the Osprey Porter 30 which some people are going to love because it is easier to fit in smaller planes as carry-on and easier to carry around town when you are out and about (at home or traveling). Of course, this means you can carry less, but having no issue on a plane with carry-on might just be worth it. Then again, maybe carrying less is also not a bad thing right? Who wants to be a packhorse! Both bags fit a 15 inch laptop, and basically the only difference between the Porter 46 and the Porter 30 is their size. This pack is like the scaled down version of the larger Porter, but they both have the same awesome features. Price-wise, it is often about a $20 difference between the two. The Osprey Farpoint 40 is a great travel backpack for use as a carry on. Again, it is a convertible backpack, carry on where the straps can be zipped away in the back. Great for travel! Osprey quality is always there with top-end material, handles, zippers and mesh. Something that I love to see in a pack that I am investing in. But, when we look at all of its features and compare them to the Porter, will it come out on top? Let's see. Naturally, there are two shoulder straps on the Farpoint, and they are padded and highly adjustable. This will make it easy for everyone to make them fit their body perfectly. Fun fact; you will know that the backpack fits you well if there is no space between the back panel or the shoulders straps and your body. There is also a handy shoulder carry strap included, which you can attach (or leave at home) if you want more options to carry it. On the front there are also compression straps which always come in handy to reduce space when you don't fully pack the Farpoint. And they also help ensure that all of your stuffs stays in place and doesn't wiggle around the pack when you're carrying it. In addition to that, there is also a sternum strap (as there should be), as well as a waist belt. In this aspect, the Farpoint is pretty much the same as the Porter. Just like the Porter, the Farpoint 40 also has a padded sleeve for your laptop. The main difference is that the sleeve on the Farpoint is inside the main compartment, so I think the Porter has an advantage here. That's because the sleeve on this pack takes away from the overall capacity of the main compartment. So, you can pack even less things in it. But the good news is that there is also a padded compartment for your tablet, so at least you know that all of you electronics will be safe. Unlike the Porter above, the Farpoint is more of a backpack which you can see from the harness. It is also zip-away (so great for storage, check-in or just putting in the overhead). But the beauty of is is that it is super padded, well made, supported with a sturdy Aluminium frame, so great for carry loads for longer periods. And the back panel is ventilated, unlike the one on the Porter. Now, I find that a huge bonus, and it largely continues to the overall quality of this backpack. The main compartment of the pack is not as large as the Porter, but then again this is a smaller pack (40L vs 46L). However, there are some cool internal compression straps you can use to get more out of the space you have. And anyway, they make this backpack in a few more sizes, so you could always get a larger one if you feel that the 40 is not big enough for you. There are also a few pockets inside the Farpoint, just like inside the Porter. One of the pockets has zippered closure, while the other is just a slip pocket. You also have the option of locking the zippers of the main compartment, but you'll have to buy the lock separately. In this aspect the Farpoint is a little behind the Porter. There are two mesh stretch pockets on the very front of the pack that can be used to store some smaller items that you need handy. And there is a zippered scratch-free pocket, which is just perfect for your sunglasses or phone. But there's no organizational panel in this backpack, like there is in the previous one. This will make it a little bit harder for you to store all the things you need handy separately from your clothes and other gear in the main compartment. So, while this pack might be comfier to carry around than the Porter, it's also not as convenient for organizing all of your belongings. In the end, it all depends on how you travel. And how you store stuff in your bag. I like to use a solid backpack with straps that are comfortable on my back and I can carry for a long time (and double as a day hike pack). So for me it is the Farpoint. It also has more than enough space, straps, pockets, and room for both a large laptop and kindle/tablet. Oh, and don't forget that Osprey released a women's fit version of the Farpoint, called the Fairview which you can check out here. But, if you need more organizational space (pockets for your phone, diary, cables, internal pockets) then the Porter is far better. It also has more space which is a good thing as you can bring more (or a bad thing - as you have to carry it, with less back-friendly straps). So this bag is more for the person who does not carry your gear far (ie. you just need to carry it at the airport, taxi, etc). I honestly don't think you can go wrong with either of them, but have a good look at the videos and points in the pros and cons, and then see what fits your travel style!